Ingman's guitar believed to have resurfaced! 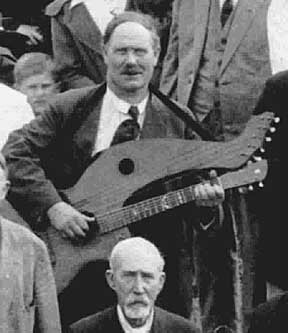 A curious side note to Otto E. Anderson's (see Anderson) connection to Chris Knutsen concerns one Ingman Ivar Strum, a gentleman who played a Knutsen harp guitar, and may have made harp guitars himself while in Seattle. The connection to Anderson is that Strum's grandson Bob is an old friend of Anderson's granddaughter, Jeanette Detlor. 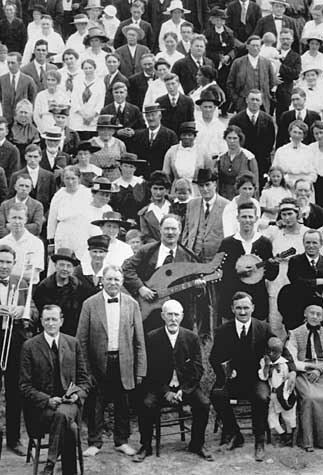 "The picture at left is part of a photograph of a Pentecostal Camp Meeting near Green Lake in 1919. 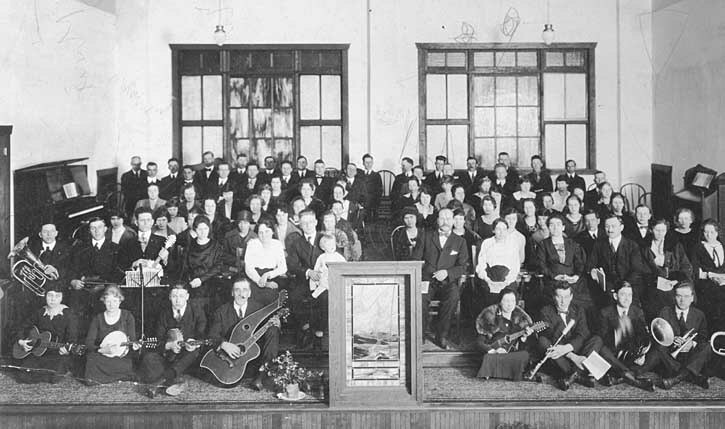 The interest in this picture is a man near the front of the group with a harp guitar. The man with the guitar is Ingman Ivar Strum, who is the grandfather of a friend of mine, Bob Strum, who grew up in Seattle and is now a dentist in South Carolina. Bob plays the steel guitar and he and his wife stayed at our house one weekend while they were visiting the Seattle area for a family reunion. We discussed the Knutsen guitars and Bob said that his grandfather also made harp guitars in Seattle and he then produced the picture. "We were later told that the picture was shown at the Strum family reunion. Bob's Aunt Julia (now 96) said she thought her grandfather bought the harp guitar (she didn't know from whom), but that he'd made a smaller guitar and a violin. I think this minimizes the possibility that Ingman Strum made guitars for Knutsen, but it is still interesting to see pictures of individuals, from years ago, with Knutsen guitars. "As a further matter of interest, another family member at the reunion had a picture, which included several family members, but also included an unknown individual playing what may well be another Knutsen guitar (Editor's note: It is. HGS36 in the Inventory - GM). The picture was taken at Bethel Temple, a Scandinavian church in Seattle. I do not know the exact date it was taken." So there you have it - another mystery! Jeanette's conversations with Bob Strum open up further avenues for speculation. If Aunt Julia's memory is correct, Strum undoubtedly bought his harp guitar from Knutsen. The guitar is an early-Seattle era instrument (see HGS35) which fits the time frame of the photograph. Julia also mentions Strum building a smaller guitar and violin (echoes of Otto Anderson? ), while Bob mentions harp guitars. All I know is that if Strum built any Knutsen copies, we historians are really in trouble! Please visit Bob's web site (on the Links page).